The city of Niagara Falls is facing some serious financial challenges and it is all down to a dispute with local tribal casinos. This dispute has cost the city millions in annual casino revenue payments made by the Seneca Nation tribe who own and run large local casinos. As part of the initial casino deal between New York State and the Seneca Nation tribe, the nation agreed to pay a percentage of their slot machine revenues each year to the city of Niagara Falls. Now due to a serious dispute over a breach of exclusivity for the Seneca Nation, the city is staring at a $9million budget short fall annually. In February of this year the Seneca Nation Resort and Casino stopped its payments to the city and to host communities. Funds have been received for the last 14 years but now the city and local communities have lost a massive source of reliable revenue. A 2002 compact between the Seneca Nation and New York State saw 25% of the slot revenue generated by the Seneca Nation Casinos pumped back into local host communities and a portion of that 25% would be paid to the city of Niagara Falls. 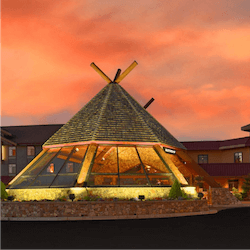 This saw a great relationship form between the three entities involved in the deal, but recent downturns in Casino revenue has seen their annual returns from the deal drop from $ 44million to $25 million which was a blow enough already and now the Seneca Nation have stopped payments completely. The main reason that payments have stopped was due to the fact that New York State had granted casino licences to three other venues in the area, providing direct competition to the Seneca Nation Casinos. This the nation says is a violation of the exclusivity deal that the casino had as part of the 2002 compact. The state officials however said that the original compact had a clause that if the compact isn’t renewed officially, it would simply roll over and renew automatically for another 7 years. The compact was due to expire on the 31st of December 2016 and in February 2017 the Seneca Nation announced that this was their last payment to the State. In an attempt to resolve this sensitive issue, both parties have agreed to enter arbitration. So far it seems that the talks could go well as the Seneca Nation president, Todd Gates was very positive regarding entering arbitration. Andrew Cuomo, Governor for New York State is currently in Niagara Falls for talks.